India's a good place to be violently reminded of your humanity. Don't we all walk a fine line between poverty and beauty? My first time in the sub-continent I bought hand-painted miniature animal paintings that you can find all over Rajasthan. 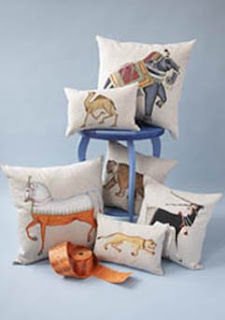 I found these Indian circus pillows from John Robshaw Textiles and would love to group them together in a nursery or nook....though the tiger might be a bit too much for a little one. Loving the new Vogue Knitting Video Fashion Preview. 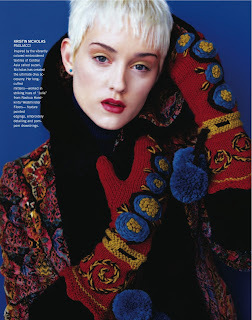 VK has always been the more adventurous of the knitting magazines and hands-down the most style-forward. But their Fall '08 issue is simply the best- with gorgeous, accessible patterns for the more dexterous (and advanced) knitter. Check out the suzani inspired mittens by Kristin Nicholas. Can't wait to wear those on a snowy SoHo evening. VK's new "Made In Canada" section highlights knitwear designers from up north including Veronik Avery, Svetlana Avrakh and Maie Landra of Koigu. And for all those knitters (or would-be knitters) who've always wanted to see how the sweaters really fit before you start the project, VK.com has created some helpful eye candy.